Whether people are in the city, suburbs, or the rural areas, everyone is following this popular fashion trend. 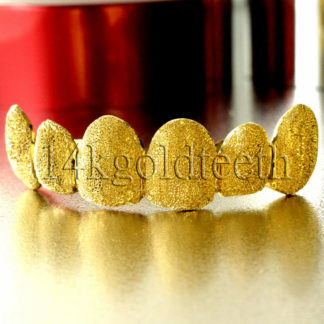 At 14kgoldteeth, we would like to offer everyone in the world the opportunity to experience this trend at a cheap custom grillz price. 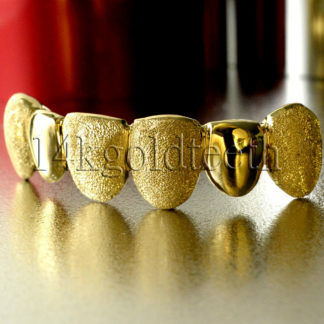 We offer bottom yellow gold products for the bottom row of teeth. 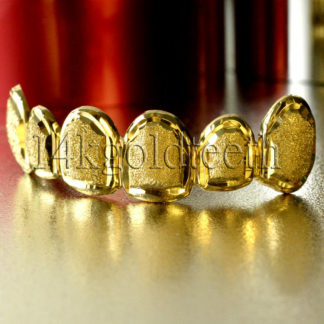 We offer our bottom yellow gold grillz in 4pc, 6pc, and 8pc. Many customers like different numbers of pieces, so we provided different options that they can choose from. We can also create products at a smaller and larger number of pieces than the three options that we have already provided. These alterations in number of pieces will need to be created under a custom order, at which customers can place with our customer service agents. The choice of metal for the product is significantly important. That is why our company offers many different types of metals that customers can choose from. We understand that each customer has his or her own preference, so we have a variety of options to choose. Our products come in different types of gold and silver. We offer three different types of gold: yellow gold, white gold, and rose gold. The number of karats that we offer for each type of gold varies depending on the type of gold. In yellow gold, we offer 10k, 14k, and 18k. However in white gold, we only offer 10k and 14k. We currently do not offer our white gold products in 18k. Our rose gold products are not listed on our website because rose gold products will need to be placed as a custom order with our customer service team. In addition, we offer all of our silver products in 925 sterling silver. While we offer many different designs that customers can choose from, our most popular design is the classic solid bottom yellow gold design. Some of the other designs include the open face design, diamond cut design, and diamond dust designs. The open face design is a small cut out from the face of the teeth so that part of the enamel from the teeth will show through the grillz. Our diamond cut designs consist of different cuts such as the princess cuts, starburst cuts, and trillion cuts. Also, our newly created designs from our diamond dust collection include a variety of beautifully cut designs that look as if the product is bedazzling and glittering, like a diamond. There are also different symbols that we have designed, and customers can always create a custom order for a design of their own. 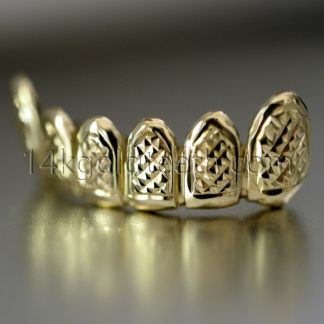 How can I wear my grillz? 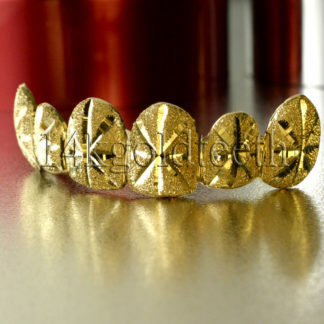 Many people ask how they should style their grillz. 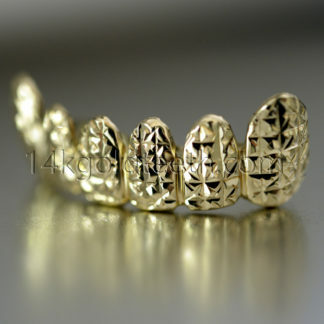 Because gold teeth is a jewelry product, people can wear it in accordance to their outfits. 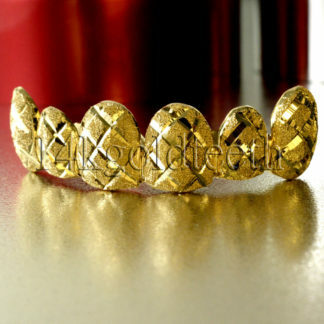 Wearing grillz is a lifestyle, and it can also be a highly accessorized fashion statement. The solid gold design is a classic structure, while the iced out and diamond dust designs are more for the bedazzled look. 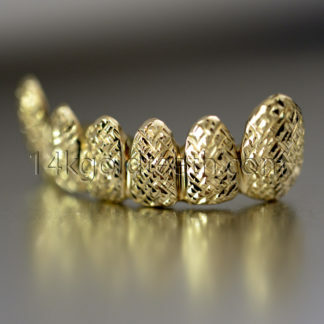 Similar to the way people coordinate their outfits depending on the occasion and event that they are attending, people can style their outfits to match their grillz. If a person is making a quick trip to the grocery store, he or she would not want to dress their best as if they were going to a night out. For this type of occasion, people can wear casual comfortable clothes with a sleek solid design. If a person is preparing to attend a high profile club or stylish event, he or she might want to reach for the bedazzled diamond dust design or iced out design to stand out in the crowd. 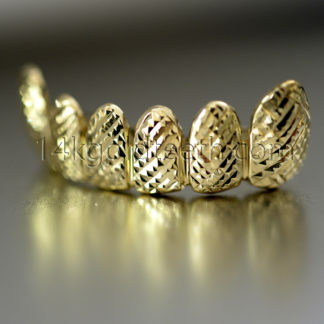 Depending on the occasion and outfit, people can wear their grillz in plenty of different ways. Whether customers want a simple design to match with any outfit, or a special custom design, our company want to create a look that will appeal to everyone. 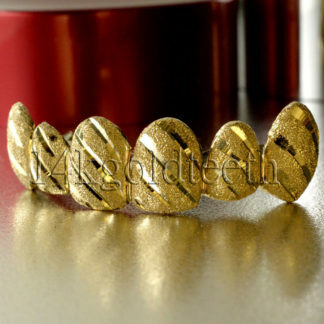 Our customers will look good and feel good in their custom gold teeth. 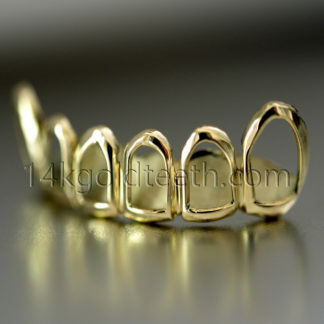 Should I get a design or solid gold teeth? Every person has his or her own preference. 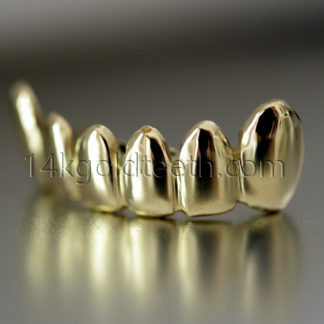 That is why 14kgoldteeth offers almost every style and design that you could ever think of. From a simple timeless solid tooth, to the brilliant diamond dust and iced out teeth, we offer a look for everyone. Since there are many designs on our website, customers might feel overwhelmed by the endless choice of possibilities. We want to help you narrow down your choices to pick the perfect custom grillz for you. Before finalizing a design, customers should keep in mind several key points. The first keypoint is to identify the usage for the product. Will this be something that is worn every day or is this something that will be worn for special occasions and a night out on town? If the product is to be worn every day, customers will want to pick a product that will be more sturdy and suitable for everyday wear. If the product is something that will be worn once in a while or on the weekends, then possibly a sophisticated design with a little bedazzle might be more suitable. The second keypoint is to identify what kind of design is suitable with the customer’s personality. An outgoing customer might reach for a product that has loud designs to stand out, while a reserved customer might want a calmer design to remain serene and subtle. The last keypoint is to pick a design that you absolutely love. No matter what the design is, if a customer falls in love with a certain design, that should be his or her pick. Whether the piece is a classic solid product or diamond dust mixed with diamonds, the customer must absolutely love the design in order to proudly wear a product with confidence.